The Rolling Stones are headed to New Orleans for the 50th New Orleans Jazz & Heritage Festival. 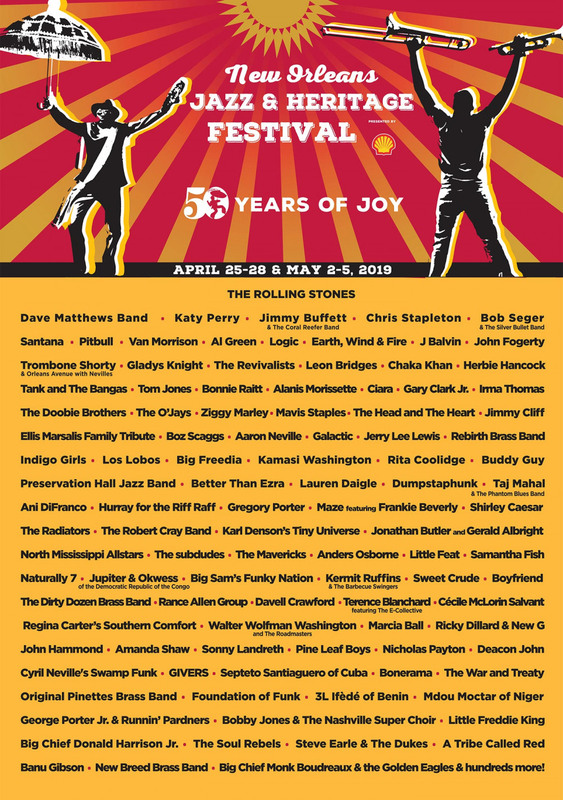 Also headlining the 2019 festival are Katy Perry, Dave Matthews Band, Santana, Pitbull, Van Morrison, John Fogerty, Al Green, Bob Seger, Jimmy Buffett and others. Rumors swirled that the rock 'n' rollers would perform at the festival after singer Mick Jagger teased that the band would stop in New Orleans on an upcoming tour. 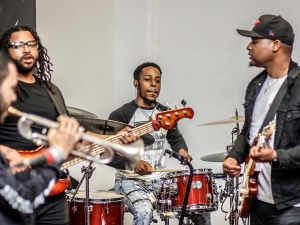 The band performs on the festival's second Thursday, May 2. The festival added a day for its 50th-anniversary event and it will open on Thursday, April 25. 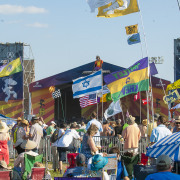 The festival runs Thursday-Sunday, April 25-28 and Thursday-Sunday, May 2-5 at the New Orleans Fair Grounds. 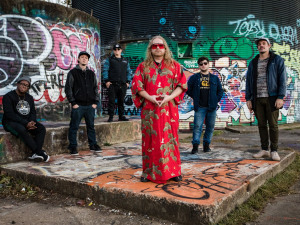 Check out the rest of the lineup below and visit nojazzfest.com for more news and information! 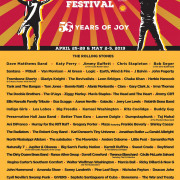 The Rolling Stones, Dave Matthews Band, Katy Perry, Jimmy Buffett & the Coral Reefer Band, Chris Stapleton, Bob Seger & The Silver Bullet Band, Pitbull, Santana, Van Morrison, Al Green, Logic, Earth, Wind & Fire, Ellis Marsalis Family Tribute, Trombone Shorty & Orleans Avenue with Nevilles, J Balvin, Gladys Knight, The Revivalists, Leon Bridges, John Fogerty, Chaka Khan, Herbie Hancock, Tank and The Bangas, Tom Jones, Bonnie Raitt, Alanis Morissette, Ciara, Irma Thomas, Gary Clark Jr., The O’Jays, Ziggy Marley, The Head and The Heart, The Doobie Brothers, Jimmy Cliff, Aaron Neville, Boz Scaggs, Galactic, Jerry Lee Lewis, Indigo Girls, Rebirth Brass Band, Mavis Staples, Los Lobos, Big Freedia, Kamasi Washington, Rita Coolidge, Buddy Guy, Preservation Hall Jazz Band, Better Than Ezra, Taj Mahal and the Phantom Blues Band, Ivan Neville’s Dumpstaphunk, Maze featuring Frankie Beverly, Ani DiFranco, The Radiators, Hurray for the Riff Raff, Jonathan Butler and Gerald Albright, Shirley Caesar, Little Feat, Gregory Porter, Anders Osborne, North Mississippi Allstars, Karl Denson’s Tiny Universe, The Mavericks, The Robert Cray Band, The Subdudes, Lauren Daigle, Samantha Fish, Jupiter & Okwess of the Democratic Republic of the Congo, Kermit Ruffins and the Barbecue Swingers, Big Sam’s Funky Nation, Sweet Crude, Naturally 7, The Dirty Dozen Brass Band, The Rance Allen Group, Boyfriend, Davell Crawford, Regina Carter’s Southern Comfort, Terence Blanchard featuring The E-Collective, The Bahamas Revue Band, Cécile McLorin Salvant, Maria Muldaur’s Tribute to Blue Lu Barker, Walter Wolfman Washington & the Roadmasters, Ricky Dillard & New G, John Hammond, Amanda Shaw, Marcia Ball, Sonny Landreth, Pine Leaf Boys, Nicholas Payton, Deacon John, Cyril Neville's Swamp Funk, Jon Cleary & the Absolute Monster Gentlemen, GIVERS, Septeto Santiaguero of Cuba, Original Pinettes Brass Band, Bonerama, Foundation of Funk, 3L Ifèdé of Benin, George Porter & Runnin’ Pardners, Bobby Jones & the Super Nashville Choir, Banu Gibson, The War and Treaty, Mdou Moctar of Niger, Big Chief Donald Harrison Jr., Steve Earle & The Dukes, The Soul Rebels, Delfeayo Marsalis & the Uptown Jazz Orchestra, Big Chief Monk Boudreaux & the Golden Eagles,Dobet Gnahoré of Ivory Coast, The Earls of Leicester, A Tribe Called Red, New Breed Brass Band, Kathy Taylor and Favor, Crocodile Gumboots Dancers of South Africa, James Andrews & the Crescent City All-Stars, The Django Festival Allstars, Lean on Me: José James Celebrates Bill Withers, Honey Island Swamp Band, Hot 8 Brass Band, Diassing Kunda of Senegal, Matthew Whitaker Trio, Jarekus Singleton, Ilê Aiyê of Brazil, Little Freddie King, Amy Helm, John Mooney & Bluesiana, Eric Lindell, BeauSoleil avec Michael Doucet, Boukman Eksperyans of Haiti, Voice of the Wetlands All-Stars, Lost Bayou Ramblers, Charmaine Neville Band, Meschiya Lake & the Little Big Horns, C.J. 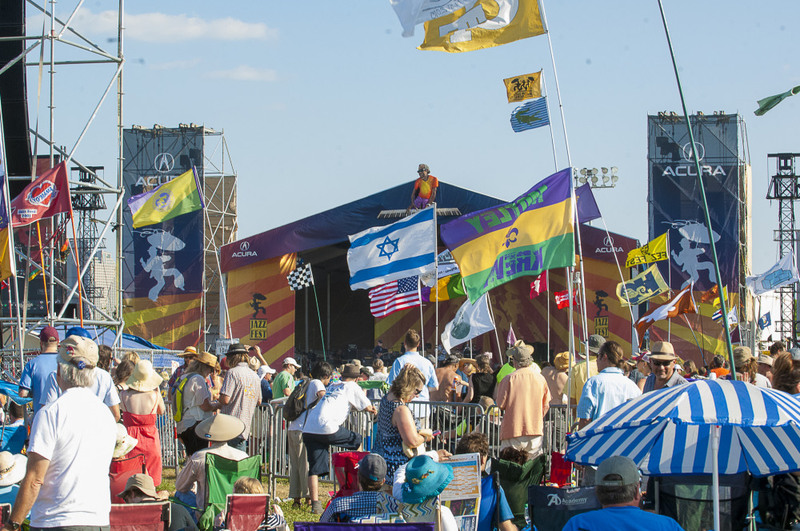 Chenier & the Red Hot Louisiana Band, Darcy Malone & the Tangle, Terrance Simien & Zydeco Experience, New Orleans Klezmer All Stars, Curley Taylor and hundreds more. A limited number of May 2 general admission tickets will be available for purchase by Louisiana Residents on Thursday, January 17 on the Plaza level of the Superdome from 10am – 6pm. Tickets will be $185 (plus applicable fees). Show a valid Louisiana ID at the box office and purchase up to two tickets to May 2. First come, first served. Buyers can start lining up at 12:01am on Thursday, January 17. Free parking will be offered in Garage 5. Tickets go on sale to the general public the following day (January 18) and are expected to sell out quickly. See nojazzfest.com for more information. Tickets are available at nojazzfest.com and ticketmaster.com, or by calling (800) 745-3000. Tickets can be purchased in person at the Smoothie King Center Box Office. 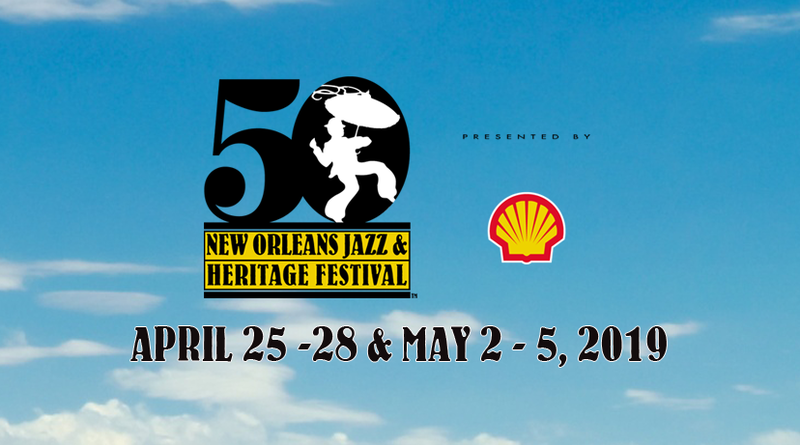 All general admission Jazz Fest tickets are subject to additional service fees and handling charges.